. 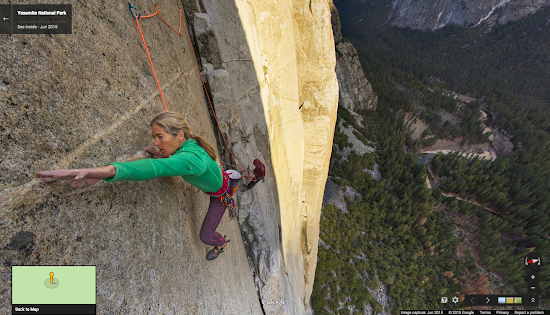 To bring you this new imagery, we partnered with legendary climbers Lynn Hill, Alex Honnold and Tommy Caldwell. Read more about the project from Tommy Caldwell, who completed the world’s hardest climb in Yosemite in January of 2015. -Ed. Maybe it was the sheer exhaustion from being in the middle of a 19-day climb of the Dawn Wall, but when the guys at Google Maps and Yosemite National Park asked if I wanted to help them with their first-ever vertical Street View collection of El Capitan in Yosemite, I didn’t hesitate. Yosemite has been such an important part of my life that telling the story of El Capitan through Street View was right up my alley—especially when it meant working with the Google engineers to figure out some absurd challenges. Climbing is all about flirting with the impossible and pushing the boundaries of what you think you can be done. Capturing Street View imagery 3,000 feet up El Capitan proved to be an extension of that, especially when you take a camera meant for the inside of a restaurant and mount it thousands of feet up the world’s most iconic rock wall. Doing anything thousands of feet high on a sheer granite face is complicated, but everyone up there had spent years of their lives on a rope and knew exactly what they were doing. After some testing, we used our tried-and-true climbing gear like cams and ropes to make sure the camera wouldn’t fall to the ground in the middle of our Street View collection. 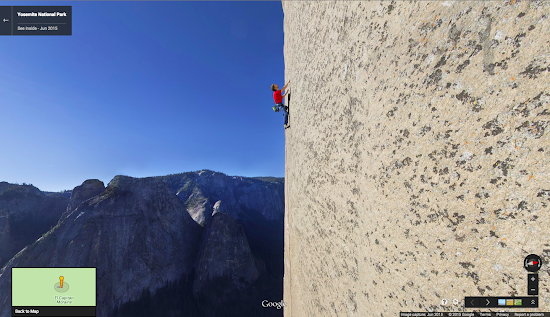 Once we figured out how to keep the camera on El Cap, we created two sets of vertical Street View. First, we collected Street View of legendary Yosemite climbers—and my good friends—Lynn Hill and Alex Honnold in iconic spots up the sheer vertical face. Lynn Hill’s ascent of El Capitan changed the paradigm of climbing, and she had an extraordinary effect on my climbing career. I’ll never forget when she became the first person, man or woman, to free-climb (using only her hands and feet) “The Nose” back in 1993. Now, you can see her navigate these epic moves— like climbing sideways on tiny holds of the Jardine Traverse, inventing a “Houdini” maneuver on the Changing Corners and traversing under the Great Roof. Any story of El Capitan had to include my good friend Alex Honnold. He holds the speed record for climbing the Nose at 2 hours and 23 minutes - most people take 3-5 days. His unwavering confidence in himself is contagious; when I’m with him, I feel like the mountain has shrunk to half its size. As you make your way around Yosemite in Street View, you’ll see Alex doing what he does best: chimneying up the “Texas Flake,” racing up the bolt ladder, or getting dinner ready in the solar-powered van he calls home. You’ll also see a glimpse of yours truly on the Dawn Wall. I spent some of my rest days during my January climb of the Dawn Wall testing out the Street View technology the Google team had sent me that month. 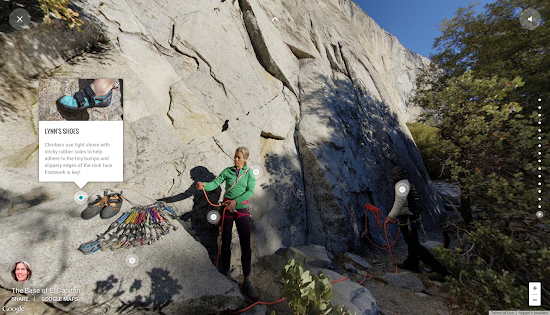 El Cap is an intimidating environment for experimentation, but years of setting ropes proved pretty helpful in figuring out how to get the equipment rigged and ready to collect Street View. Then, we really put Alex to work to collect the second set of Street View: the entire vertical route of “The Nose” on El Capitan. One of the few people that could do this efficiently and quickly, Alex took the camera and pretty much ran 3,000 feet up with photographer partner Brett Lowell. Now, anyone can get the beta (climbing speak for insider advice) before they climb the entire route. Lynn, Alex and I also helped create a new Yosemite Treks page, where you can take a tour up El Cap and learn more about climbing, from what a “hand jam” is to why we wear such tiny shoes. And as a father, I’m excited kids will learn more about Yosemite when Google brings students to the park through NatureBridge later this year as a part of this project. Plus, its pretty awesome that students who can’t make it to Yosemite yet will be able to go on a virtual reality field trip to the Park with Google Expeditions. Yosemite’s driven so much of my life that I’m excited to be able to share it with the world through my eyes. These 360-degree panoramic images are the closest thing I’ve ever witnessed to actually being thousands of feet up a vertical rock face—better than any video or photo. But my hope is that this new imagery will inspire you to get out there and see Yosemite for yourself… whether you travel up a rock wall or just down the trail. Today we’re launching our first-ever vertical Street View collection, giving you the opportunity to climb 3,000 feet up the world’s most famous rock wall: Yosemite’s El Capitan. To bring you this new imagery, we partnered with legendary climbers Lynn Hill, Alex Honnold and Tommy Caldwell. Read more about the project from Tommy Caldwell, who completed the world’s hardest climb in Yosemite in January of 2015. -Ed.